The authors thank NYSERDA for funding the project titled, Long Day Energy Efficient Lighting for Increased Milk Production on Dairy Operations, and acknowledge the time, effort, and subject matter expertise provided by Michael Capel of Perry Veterinary Clinic, the Meyer family of Dairy Knoll Farms and Sandra Meier, NYSERDA. •	Researchers conducting an on farm study designed to measure milk production, energy usage, and light brightness under Long Day Photoperiod (LDPP) conditions and alternative lighting technologies concluded that the Light Emitting Diode (LED), LDPP or the T8 (a tubular fluorescent fixture), LDPP treatment did not affect milk production when compared to the T8, non LDPP control. However, differences in energy use among lighting technologies were measured. •	Using data from three nearly identical barns, assuming no expected milk response, partial budget and Net Present Value (NPV) results per barn suggest that LDPP using LED or T8 technology cannot be expected to increase profit or to yield NPVs greater than or equal to zero when compared to the T8, non LDPP control. Results are sensitive to bulb lifetime in hours, energy cost per kilowatt hour (kWh), expected milk response and others. For example, if expected milk response is 3 pounds per cow per day, then the LDPP treatments can be expected to increase profit and yield NPVs greater than or equal to zero for all combinations of fixture life and energy cost per kWh evaluated. •	Partial budget and NPV results suggest that LED and T8 fixtures can be expected to increase profit and yield NPVs greater than or equal to zero when compared to 400Watt (W) High Pressure Sodium (HPS) High Bay fixtures. Results are sensitive to fixture lifetime in hours and energy cost ($ per kWh). Between August 2012 and January 2014, the NWNY Team completed a study evaluating the energy savings and effective light provided by LED and T8 fluorescent lighting systems in dairy barns. Also assessed were the impacts of the two lighting systems on manipulating photoperiod and milk production. Previous research has shown that exposing lactating dairy cows to 16 to 18 hours of light (long day photoperiod or LDPP) can increase milk production by approximately 5.1 pounds per cow per day (Dahl, G. E. 2010. Effect of Photoperiod on Feed Intake and Animal Performance. Extension. http://www.extension.org/pages/25470/effect-of-photoperiod-on-feed-intake-and-animal-performance. ) It was hypothesized that using LED fixtures to implement LDPP would be preferable over T8 fixtures, as T8s do not perform well in cold weather, which is precisely when the extra light is needed most. The study utilized three nearly identical barns, measuring approximately 220 feet long by 114 feet wide, on a commercial dairy farm. Existing high pressure sodium (HPS) fixtures were replaced with either new LED or T8 fluorescent fixtures. 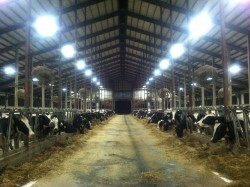 Two barns were placed on an 18 hour lighting interval, one with LED fixtures and one with T8 fixtures. The third barn (the control) was placed on a conventional lighting interval with T8 fixtures. Milk production, energy usage and light brightness at cow eye level were measured in all barns for the duration of the study. Despite previous research results, LDPP did not produce an increase in milk yield in this study. In theory, LDPP sounds like an easy way to make more milk. In practice, we learned that implementing LDPP on commercial dairy farms can be challenging! LDPP requires 6 to 8 hours of uninterrupted darkness following the 16 to 18 hours of light, which can be a difficult condition to meet when milking 3X. Although the lights were placed on timers to achieve the necessary 6 to 8 hours of darkness, sometimes part of a group was exposed to light during their “dark” period, because they were still in the holding area or milking parlor. In addition, part of the study took place during the extreme cold of the winter of 2013/2014. This caused two of the waterers to freeze in the LED barn, therefore providing inadequate access to water for part of the season. Reduced energy use associated with LED and T8 fixtures relative to the existing, before study 400W HPS fixtures were measured (Table 1). Table 1. Percent Change in Energy Use, Barns A, B, and C by Technology vs. Existing, Before Study, 400W HPS -- Hours of Use, and Number of Fixtures Fixed for Each Comparison. Note: Hours of use and number of fixtures for Barns A, B and C were 18 hours per day and 32, 18 hours per day and 36, and 13 hours per day and 12, respectively. Partial budgeting and Net Present Value (NPV) analysis were used to evaluate economic aspects associated with LDPP and alternative technologies. Analysts used the partial budget approach to estimate the change in profit associated with a change in the farm business, for example, in Barn A, a change to LED LDPP from T8 non LDPP, proposed vs. current, respectively. NPV analysis considers the time value of a stream of net cash flows, net cash incomes over the life of the investment. If the net present value of an investment is greater than or equal to zero, then the investment is attractive to the decision maker. All analyses are at the barn level, and reflect roughly 2012 price levels. Capital investments required to fit Barn A with LED LDPP, Barn B with T8 LDPP, and Barn C, the control barn, with T8 non LDPP totaled $43,758, $12,383, and $4,128, respectively. Analysts obtained net milk price, and expenses for dairy grain and concentrate and other purchased inputs per hundred weight of milk from the Dairy Farm Business Summary Program (Cornell University). For the LED LDPP vs. T8 non LDPP control comparison, given an expected milk response of 0 pounds per cow per day and a LED lifetime of 80,000 hours, partial budget analysis yielded an expected change in profit for an average future year of negative $8,400. Expected changes in profit for all 15 combinations of LED lifetime and electric cost evaluated via sensitivity analysis were negative (Table 2). Table 2. Expected Change in Annual Profit, LED LDPP vs. T8 non LDPP Control by LED Lifetime in Hours by Dollars per kWh. Results are sensitive to expected milk response. For example, if the response equals 3 pounds per cow per day, then expected change in profit for Barn A is $10,325, and NPVs for all three LED lifetimes are greater than zero. For the T8 LDPP vs. T8 non LDPP control comparison, given a milk response of 0 pounds per cow per day and a T8 lifetime of 24,000 hours, partial budget analysis yielded an expected change in profit for an average future year of negative $6,846. Expected changes in profit for all 15 combinations of electric cost and T8 lifetime were negative, ranging from a low of negative $8,095 annually for the $0.12 per kWh, 20,000 lifetime hours combination to a high of negative $5,597 for the $0.08 per kWh, 30,000 hours combination. Analysis yielded an NPV of negative $22,138 for the 24,000 hour life. Results are sensitive to expected milk response. For example, if the response equals 3 pounds per cow per day, then the expected change in profit for Barn B is $11,879, and the NPV for the 24,000 hour T8 lifetime is positive. A second set of analyses evaluated LED and T8 technologies compared to the before study, 400W HPS High Bay system. Analyses reflected equal numbers of fixtures and annual hours of operation for the study and before study comparisons. For example, for the Barn A study vs. before study comparison of LED vs. HPS, fixture numbers and hours of operation per day were constant at 32, and 18, respectively. Given a milk response of 0 pounds per cow per day, partial budget, NPV and sensitivity analyses comparing LED and T8 systems to the before study 400W HPS system for Barns A, B, and C yielded expected increases in profit over a range of hours of lifetime and $ per kWh, and NPVs greater than zero. Note that the analyses developed do not reflect marginal internal or external economic and environmental benefits and, or costs associated with the different technologies, for example, those potentially attributed to mercury contained in fluorescent fixtures. What does this mean to you? First of all, if you are considering replacing outdated lighting fixtures with newer, more energy efficient fixtures, this could have a positive economic impact on your farm due to a decrease in energy usage. Farmers who have made these updates have also cited other benefits, such as the increased ease in working with cows in barns that are better lighted. As for LDPP, we’ve learned that it takes precision to make it work correctly, and that it is only economical if it does indeed yield an increase in milk production. Minimum requirements for light levels at cow eye level must be met in order for LDPP to work, so if you are considering utilizing LDPP, it would be prudent to have a lighting engineer evaluate your barn before installing new fixtures.